At long last I have a morning that allows me to sleep in so I take full advantage and don’t rise until past noon. 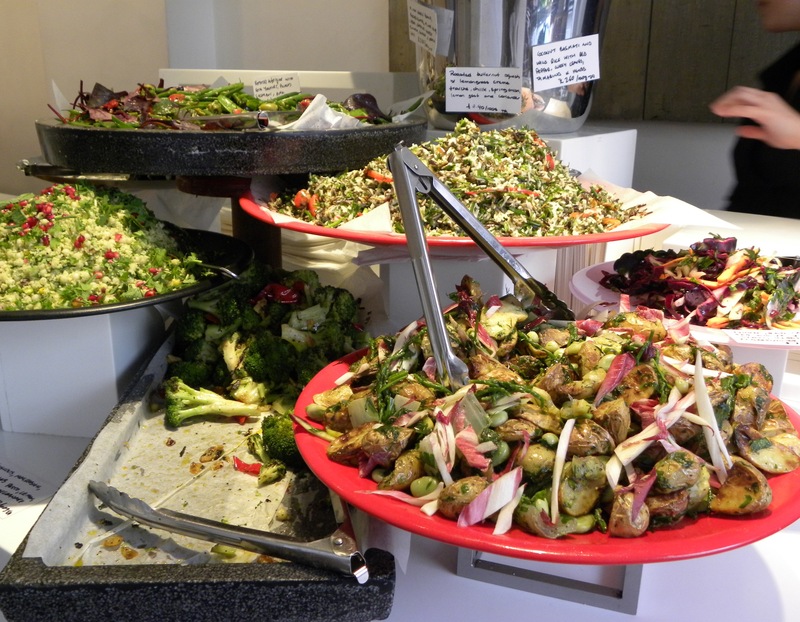 Since that throws any hopes of having a productive start to my day I head on over to Ottolenghi to have brunch and to catch up with a friend that I haven’t seen in forever. Their food always makes me feel ultra healthy up until the point where I misbehave and order a dessert. I decide to try their rhubarb tart and of course it’s delicious. Both of their cookbooks Plenty and Ottolenghi – The Cookbook decorate my personal library so I know very well what I’m in for. Oh dear, it would be so much easier if I didn’t like cakes, pastry, chocolate and cookies as much as I do. Then on a full stomach it’s time to get working again. My latest project is a photography one so I bring along my camera (which is with me most of the time anyway) for a stroll around the Chelsea, Notting Hill area and end up taking in the busy sights of Portobello Road. It’s a party, the streets are lively with musicians rocking tunes, antiques exchanging hands, plants, kitschy London souvenir shops, smoothie and food vendors, animals and a ridiculous amount of baby strollers line the streets. Although I often dread overly busy streets, today it works to my advantage as people are exactly what I’m in search of. I get exactly what I came for but for now I’ll have to wait to reveal the official images to you all. Soon though darlings I promise. 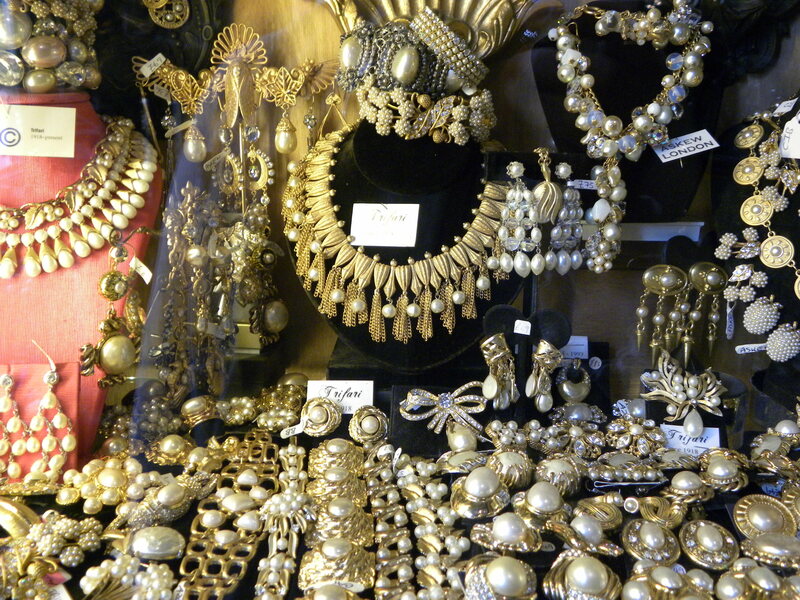 On Pembridge Road, I, like everyone else stops to gawk at the jewelry in Hirst Antiques. It’s total eye candy as almost everything glitters and sparkles. Inside the boutique the display cases are stuffed with accessories which are organized by color. The diva inside me is convinced that I’d look absolutely amazing in everything I see but luckily my common sense hasn’t gone entirely out the window so for today I manage to resist turning into a showgirl. This entry was posted in Food, Life style, London, Restaurants, Shopping and tagged A Day in the Life Of..., Antiques, Day 4, Diary of a Somebody, Food, Jewelry, Life style, London, Notting Hill, Ottolenghi, Photography, Restaurant, Shopping by linneabylinneanilsson. Bookmark the permalink. How exciting! Lovely jewellery, I could totally picture you sneaking back to buy the lot without telling us about your little adventure. Food and jewellery – both made for feasting on.